The Viking Sky lost power on Saturday and sent out a distress signal after it started drifting towards land. ,373 mostly elderly passengers from the ship in bad weather. The vessel's engines have been restarted and it is heading towards the port of Molde. Evacuations have been stopped for now but rescuers said they could summarize the captain's necessities. 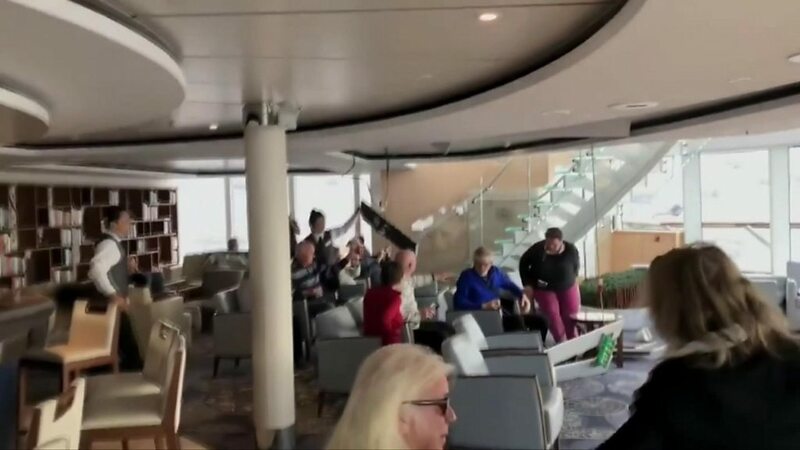 The Viking Sky suffered engine failure on Saturday afternoon while en route to Stavanger from Tromso in a notoriously treacherous stretch of water. Fis herman Jan Erik Fiskerstrand, whose boat was one of the first to come to help Viking Sky, told Aftenposten newspaper, "it was just minutes before this could have gone really wrong". The ship could have hit the rocks "if they had not started the engine and fastened the anchor "he added. Five helicopters and several rescue ships were called, but poor weather meant the lifeboats were forced to turn back. Among those rescued 20 people suffered injuries. It is said to be British or US citizens. Derek Browne, from southern England, who was traveling with his wife Esther told the BBC he had been "rolling and rolling" every night on Friday before losing engine power on Saturday. Media caption British passenger Derek Browne : 'We were told Mayday Mayday!' Passengers wearing life jackets are waiting to be rescued. One of those still on board, Lara from Birmingham in the UK, said "the crew were magnificent and have kept the remaining passengers safe and warm. The company said "all of this, our first priority was for the safety and wellbeing of our passengers and our crew".